Seeing Neil Gaiman’s Norse Mythology in a bookstore brought back a memory from childhood: I’d been lying on a sofa, around seven years old; the sun was peeking through the curtains, and boy-me was clutching a book of myths I must have received from Christmas, feeling, despite the warm weather, very, very cold. I had been amazed at how much the book was drawing me into its icy world. There was an ornate drawing of some sort on the left page of a man going into a cave, and the text on the right talked about how brave he was for entering somewhere dangerous. That’s all. I have a poor memory at the best of times, and most of what I read as a boy has vanished as years go on, but I remembered this. I needed to find out which story it was which had stayed lodged within my sieve-like brain after all these years, and so I snatched up both a hard-copy and an audiobook of Gaiman’s retelling so that I could stay completed immersed in these stories over the following days. 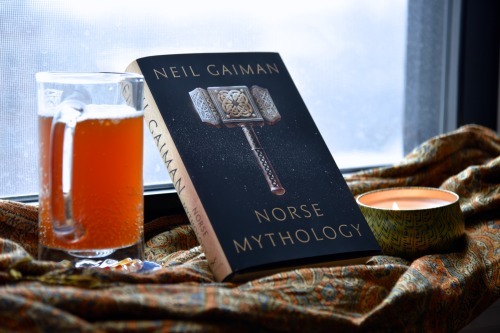 Gaiman’s soothing tone works incredibly well with bombastic stories like the Norse myths, rather than the comparatively constrained affair of his novels. His work has always been most interesting when it ventures into the surreal, such as in the Sandman comics, and so I went in optimistic and wasn’t disappointed. There’s such a sense of fun here that it’s hard not to be tickled at nearly every page by both the delightful tone and raucous interpretations of dialogue. Characters like Thor are just delightful to be around, acting as the comic relief in a book which I expected to take itself extraordinarily seriously. Eventually, around halfway through the middle, I realised it likely hadn’t been a cave in the story from my childhood, but a mountain-side needing to be cracked open. I realised the man I remembered hadn’t been a man at all, but a God. I realised that it had been Odin, and that the version I was now reading—where Odin tricks, fucks, and abandons a giantess—was likely very different from the one I’d found as a child. It was no less entertaining for all that. Nostalgia plays a part in why this drew me in so much I don’t doubt, but Gaiman knows just the right way to pace a short story, and so knows just where to tweak old tales to keep things zipping along for modern readers. I think the reason that this retelling is such an astonishing success is that if there’s one set of myths tailor made to become a comedy, it’s the Norse ones. Its characters are both endearing and frustrating, lovable and appalling; their values are so different to ours that their struggles for glory come across as comical, and Gaiman plays up these differences to tap what could be alienating for amusement. Gaiman’s interpretation of the tale I had loved so much as I child, in which Odin drinks the mead of poetry, ends with a chase scene. A giant has turned into an eagle, and Odin needs to quickly lose him before entering Valhalla. The wise, temperamental king of the Gods decides that sharting (yes, sharting) mead into his enemy’s eye is the best way to handle this situation. I really, really liked this book.